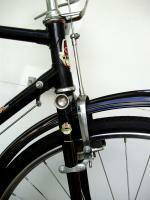 Bicycle Repair Forums - BikeRide › Maintenance & Repair › Bottom Brackets › What tool removes this? This is the BB of my schwin varsity. I'm learning how to remove and regrease the crank bearings. So I've got the crank puller and the head/crank wrench, but clearly there is a tool that fits inside the this "crown" and removes it to get at the bearings. What is that tool? In the mean time I was able to engage it by opening a pair of needle nose pliers very wide on the inside of the flange with the teeth. Hey, thanks so much. This bike only has about 300 miles on it. Do I really need to replace the crowns and the spindle? I'm doing the bearing thing because I've got a "clunk" that can only be coming from the crank and cleaning and repacking the bearings seemed to do the trick. some cheaper bb have been know to fail premature or have flex. if this does not work replace it. Thanks Painkiller, that's what I did. The bb were in good shape. After reassembly the "clunck" was gone. I think maybe it was a lack of lubrication. Lots to learn here. you are very welcome my friend, glad it worked out. what you have experienced with this bicycle is a classic case of improper assembly. this is why i feel for the 30 bikes a day guy and the people that purchased the bikes set up in this fashion. I do not know what people might do with their bike but I know what I might do with mine and would rather not die or get hurt because my bike failed because of ignorance or an inferior product. Will he need to turn this clock wise or counter clockwise when he removes it? Many don't take that into consideration when they never removed the bb before .